Early Wound: If you developed the masochist structure, you most likely had a parent, who was overly controlling, protective, humiliating, or punishing—especially around food intake and potty training. This thwarted your self-expression and creativity. The only recourse your child self had against this overt suppression was to inwardly say, “No, I won’t,” while outwardly conforming. 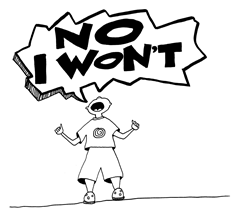 This sets up a life-long pattern of saying no—even to things your adult self wants. Since your self-expression was squashed as a child, it’s now important to unleash your creativity through journaling, art, music, and dance to name a few.